With U.S. sales up 20% over the same period last year, Audi has again earned the bragging rights of a record month in January, 2011. Perhaps most impressive were sales of the all-new A8, recording a 765% year-over-year sales increase. And not to be overlooked is the rising popularity of Audi's clean diesel models; reporting 66% of all A3s were sold in TDI trim. Full press release after the jump. HERNDON, Va., Feb 1, 2011 - Audi today reported January U.S. sales of 7,812 Audi cars and SUVs, which accounted for a 20% overall increase from January 2010. 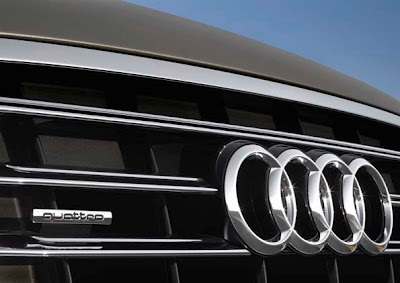 The previous January sales record for Audi in the U.S. was the 6,510 vehicles sold in 2010. The strong January 2011 results followed the best year that the luxury brand has seen in the U.S. as sales surpassed 100,000 for the first time to finish the full year at 101,629 vehicles. The 8.6% share that Audi held in overall U.S. imported luxury vehicle sales at the end of 2010 also set a record for the brand. Audi models have already earned significant awards in the U.S., including the Edmunds.com Technology Breakthrough Award to the 2011 Audi A8, four category winners in the Strategic Vision 2010 Total Value Index and the EyesOn Design “Best Production Vehicle” awarded to the Audi A6, which is scheduled to arrive this Fall. In January 2011, Audi recorded year-over-year sales increases exceeding 50% with five of its models: the Audi A3, Audi A8, Audi Q5, Audi Q7 and the Audi R8. Sales of the 2011 Audi A8 flagship model, introduced in late November, jumped 765.4% from a year earlier as consumers continue to respond favorably to the most technologically advanced vehicle Audi has ever produced. January 2011 Audi A3 sales climbed 52.8% from a year earlier as consumers continued to demand the Audi A3 TDI clean diesel model, the 2010 Green Car of the Year. Audi Q5 crossover sales continued to show the strong momentum built throughout 2010 by posting a 50.9% gain from January 2010 sales. The Audi Q7 full-size luxury crossover sales also showed a nearly 60% rise from January 2010. 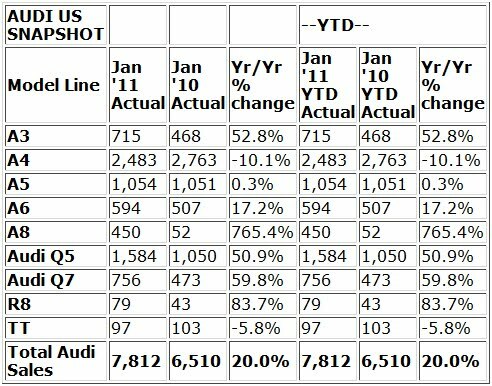 • January 2011 ranks as the best January in Audi of America history, eclipsing the record set in 2010. • Audi A8 sales numbers skyrocket due to launch of redesigned 2011 Audi A8 flagship. • Five models within Audi lineup post gains of over 50% YOY. • Audi Q5 sales in January second only to A4. • Audi Q5 sales up 50.9% for January YOY. • Audi Q7 sales up 59.8% for January YOY. • Audi A3 sales rose 52.8% in January; A3 TDI represents 66% of sales mix. • Audi A6 luxury sedan sales up 17.2% YOY. • R8 sales record 83.7% uptick over January 2010. 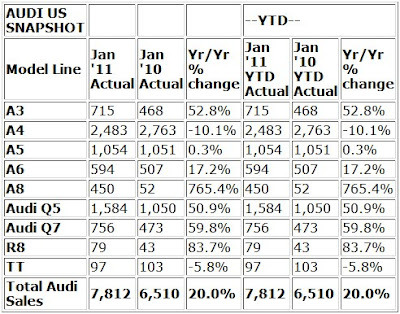 • January 2011 CPO sales of 2,232 units represent 32.1% YOY surge from 1,690 vehicles a year earlier.